This is Post #3 of the 2018 Home Trend to Watch Series. View the second one: Typography. In 2016, 80 million smart home devices were sold, a 64% increase over 2015, and the final sales totals from 2017 are expected to surpass that. 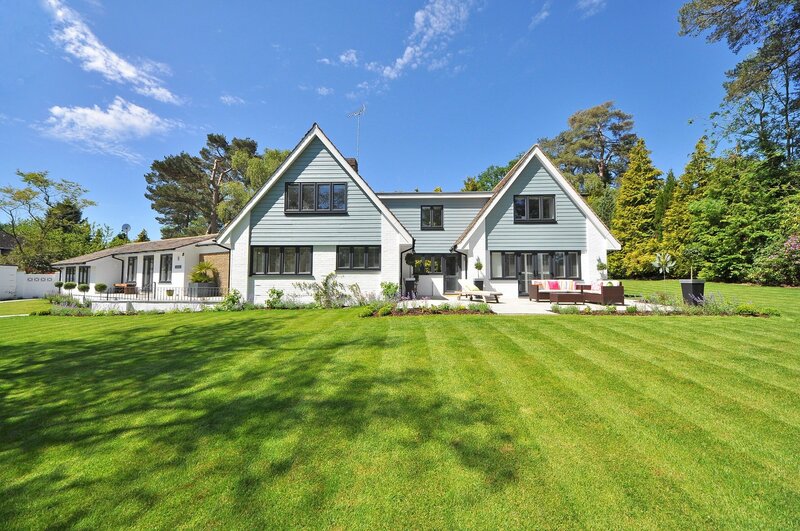 Home technology is increasing at a quick rate, mainly because the companies producing them are starting to fully understand how to educate buyers on their value and function. 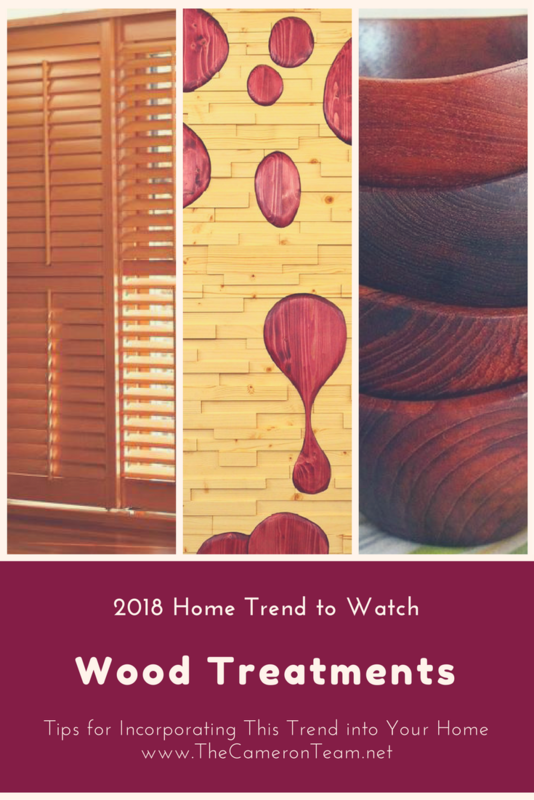 Maybe it’s just coincidence – or maybe home owners are feeling a need to reconnect with all that’s natural in the wake of the increase in technology – but wood treatments are on the rise and is one of Pantone’s predicted 2018 home trends. So, what exactly are wood treatments? We’re not talking about stains, preservatives, or fire retardants. We mean a general incorporation of wood in a home’s décor and finishes. It’s important to note that the whole point of decorating with wood treatments is to display the wood grain. While a product may be made with wood, if it’s painted white, black, red, or any other color, it’s not going to have the same effect. Stained wood allows the natural grain to come through, which maintain the down-to-earth, outdoors-brought-indoors appeal. 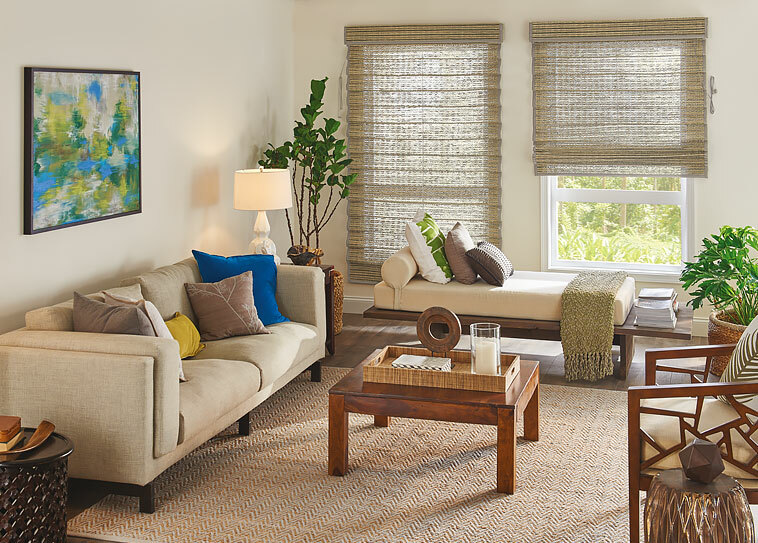 White blinds and shutters have been on trend for the past 10+ years, but 2018 may see the fierce return of wood finish window treatments. 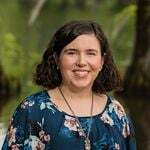 Budget Blinds of Wilmington has a couple of good examples. The first is wood shutters. These are popular in low country, colonial, traditional, and craftsman style homes. 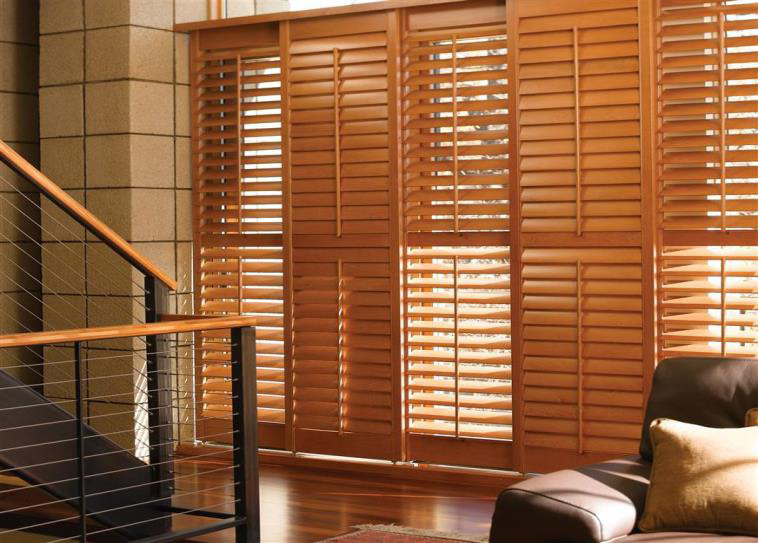 Do shutters feel too “heavy” to you? Woven wood shades are an alternative. 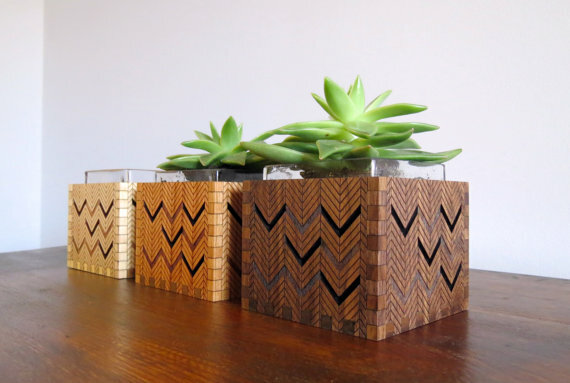 They’re handcrafted from rattan reeds, grasses and natural woods. They aren’t as thick or bulky as shutters, so they have a “lighter” look to them. Depending on the weave, they also let in a little bit of light while still blocking the view from the outside. Mirrors are a lovely way to incorporate wood in a room. 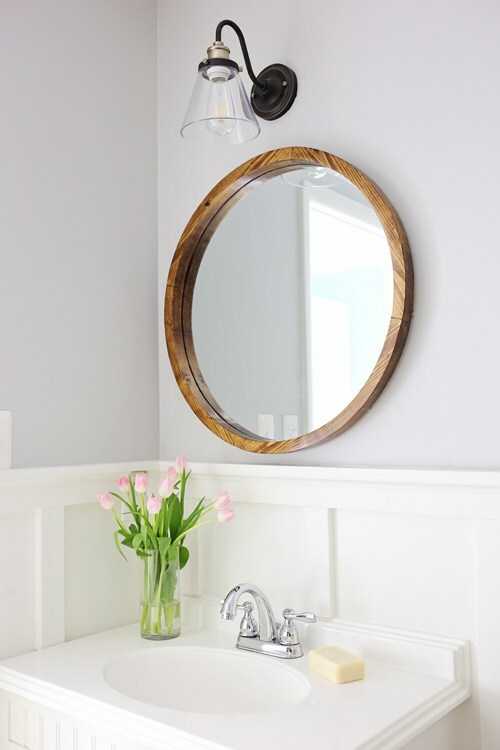 Angela at Angela Marie Made created a gorgeous round wood frame mirror for her bathroom. She shares the whole tutorial on how she made it on her website. The best part is that it only cost her $50 to make versus buying similar quality mirrors for a few hundred dollars more. Not a woodworker? 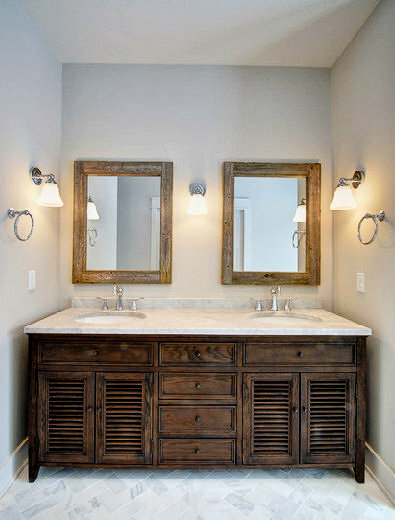 Country by the Bumpkins makes beautiful wood bathroom mirrors, including this rectangular set. 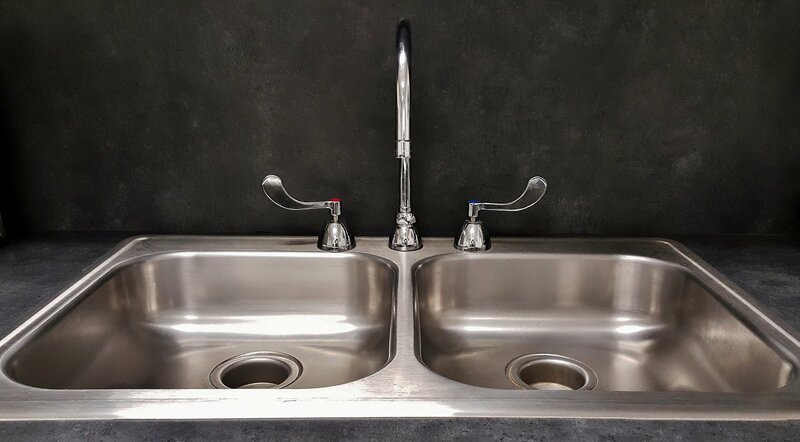 It pairs well with double sink vanities and the reclaimed wood that she uses is a perfect example of the type of materials used in the wood treatment trend. 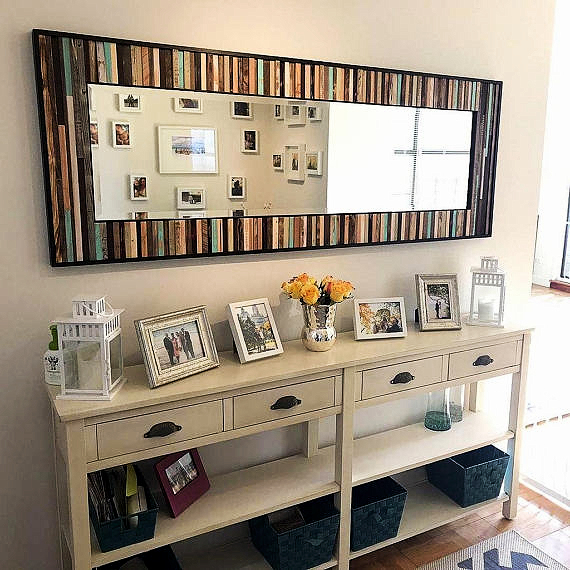 Scrap Wood Design makes wood mirrors with texture and a touch of color. This one in particular is a nice fit for a hallway or entrance. Each piece is made to order, so you can choose the colors and varnishes that best fit your home. 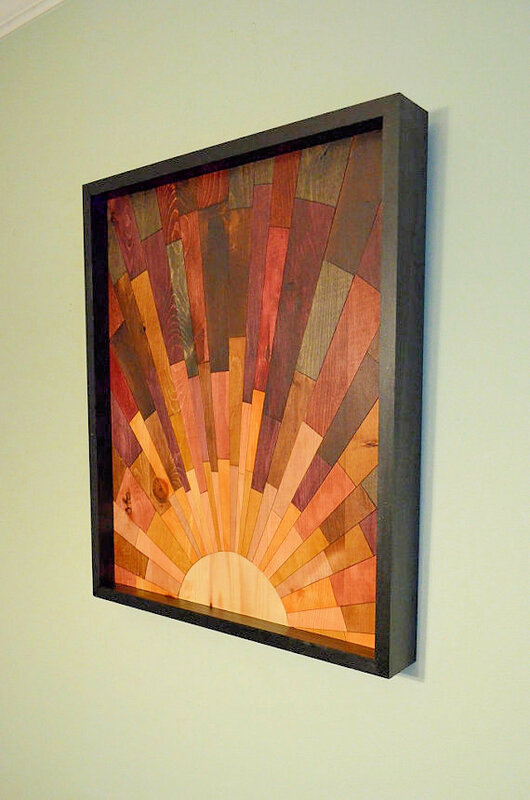 Wall art is a fun way to incorporate the wood trend into your home. Artists are creating beautiful pieces from abstract inlaid designs to intricately etched landscapes in reclaimed wood, and there’s a wide range of subjects and themes to choose from, so there’s something sure to match the décor of your home. This sunrise from Stains and Grains in Raleigh, NC, is one example. The swirling grains are preserved but the pieces are allowed to pop with color. 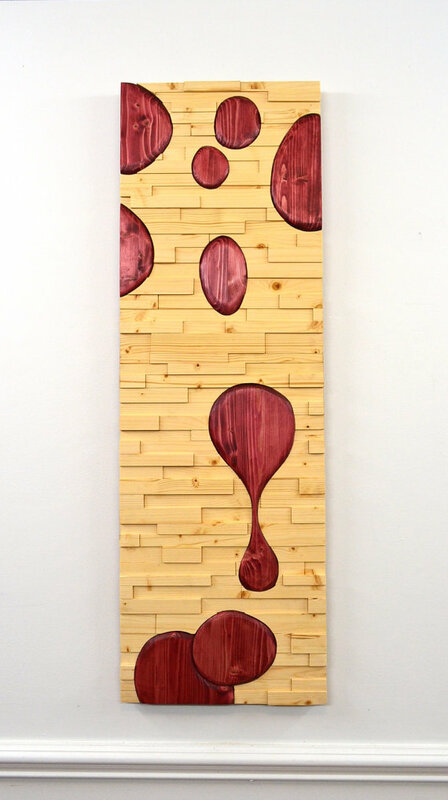 This is another great piece from Stains and Grains called Lava. The piece uses wood in two different ways. Recreating the look of classic lava lamps, the “lava globs” really look like they’re moving against the textured wood backdrop. We believe it’s very important to safely secure any guns you have in your home. You just never know when a child may get their hands on one that isn’t properly stored. That’s one reason why we think this locking solid pine concealed gun storage from Heinz Woodcraft is so cool. 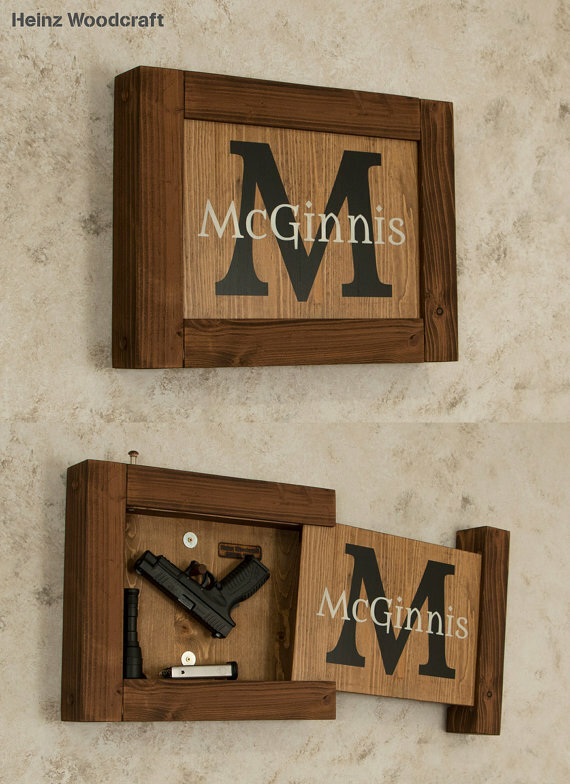 Not only does the monogram design fit our wood treatment theme, but it can be mounted up high away from little hands and no one but you and who you choose will know what’s inside. You know the wood paneling of the ‘60s and ‘70s? Let’s not do that again. ‘Kay? 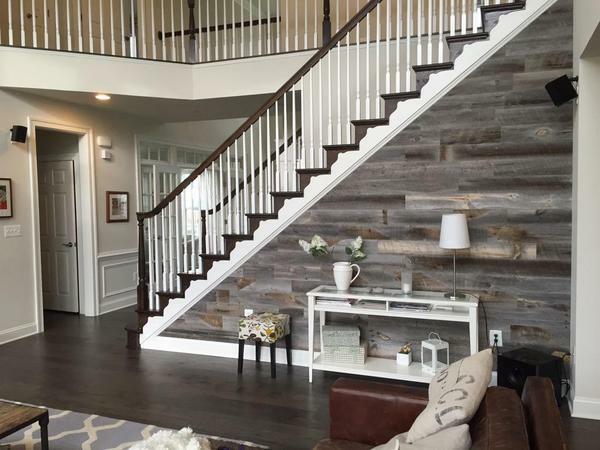 Instead, try a wood accent wall. It’s a great way to provide depth and texture, and to define a space within a room. 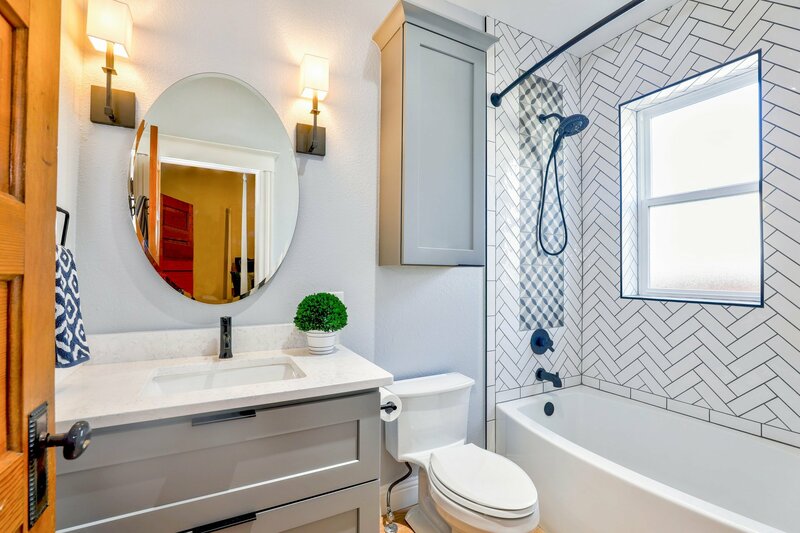 Take for example this master bathroom from Bless’er House. They installed wood planks above the bathtub. You can see the whole process on their blog. If you aren’t very handy, Stikwood makes an excellent peel-and-stick product in multiple wood finishes. Here it is used on a staircase. It matches well with the banister but really sets the wall apart from the other surfaces in the same vicinity. Want to think outside the box? 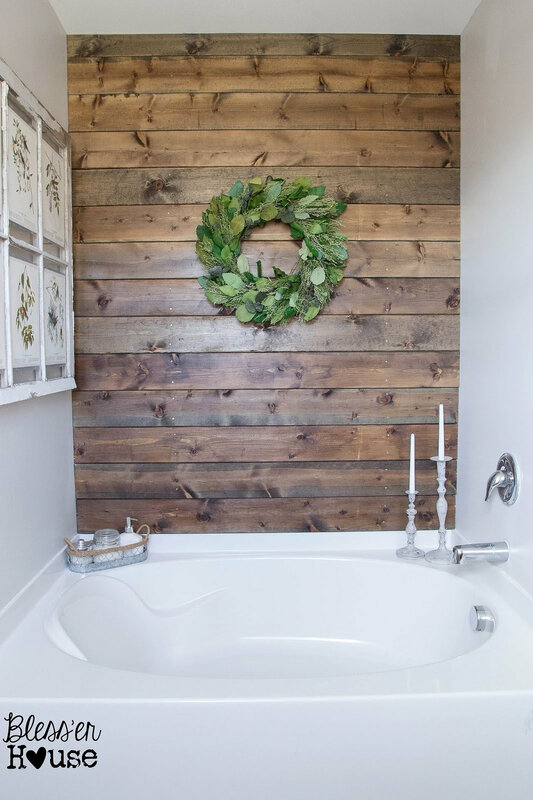 You can transform other areas of your home with wood paneling. 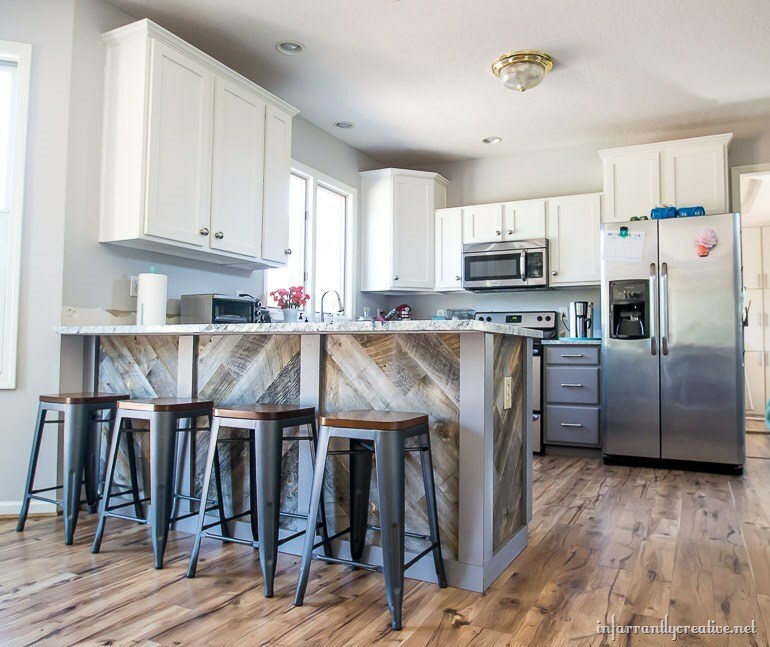 Check out this kitchen peninsula from Infarrantly Creative. They share the makeover on their blog – truly inspiring for anyone thinking about making over their kitchen. Walls aren’t the only major surface that can be great for setting a room apart. 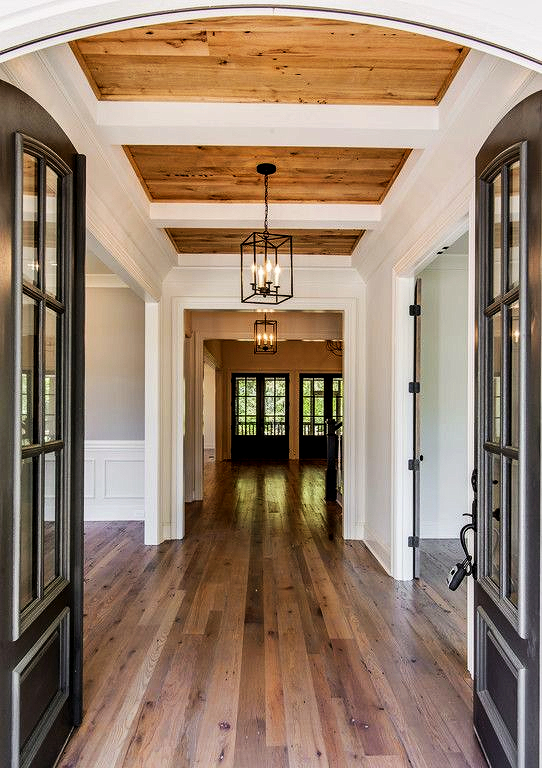 Paneling can add a wow factor to entrances, kitchens, and other rooms with recessed ceilings. This entrance hall from Vintage South is one example of that. Small home décor pieces are also a good way to incorporate the wood treatment trend. Wooden bowls and plates are very popular right now. You can put them on display in your living room or use them in your kitchen to hold your fruit. There are so many designs to choose – vintage to modern and hand carved to machine turned. 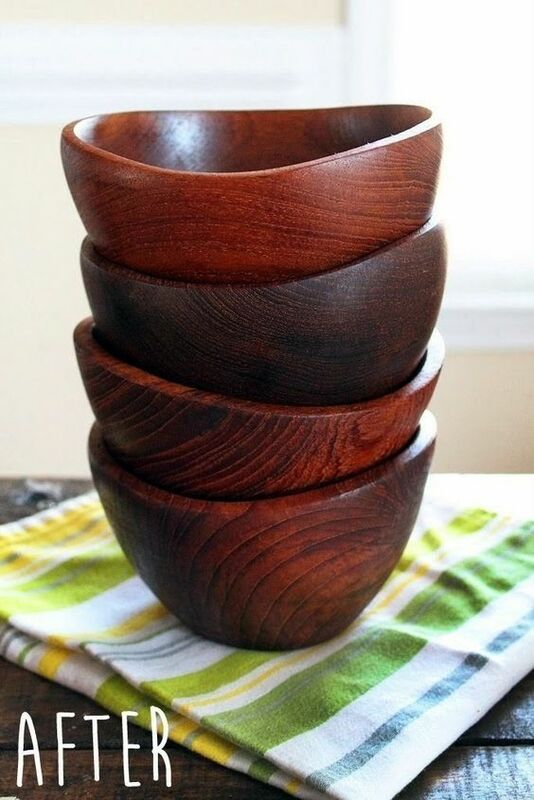 They can get pretty expensive, but Cut Out + Keep has a tutorial on how you can refinish old wood bowls, like those you may find at a thrift store. 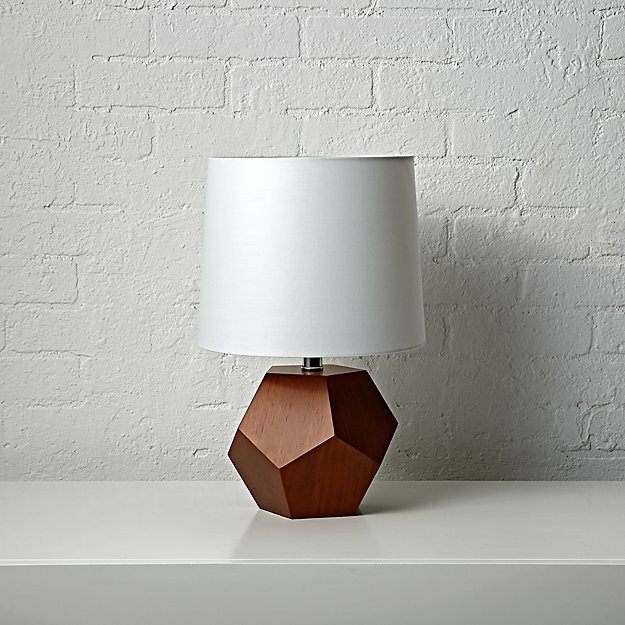 A simple lamp with a wood base is also a way to add that wood element. Oh, look! This one from the Land of Nod even fits in with the 2018 Geometric Patterns trend. Wood vases are another attractive choice. These from Grain Deep work great with succulents, which are very popular right now. We just can’t guarantee that they’ll give you a green thumb. Finally, all the better when you can incorporate some natural looking wood furniture in your room design. 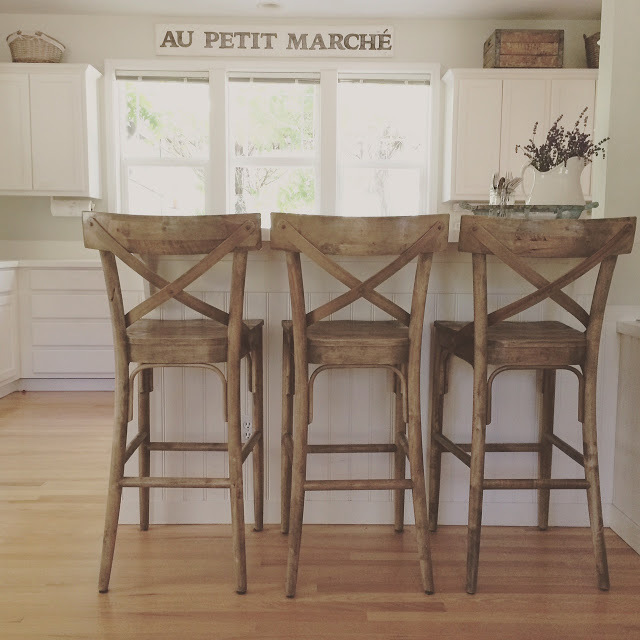 Take for example these high back wooden barstools that Julie at Little Farmstead put in her kitchen. They’re a little bit rustic and fit in nicely with the farmhouse theme. These are just a few examples of how the wood treatments trend can be included in your home décor. Before you start decorating we encourage you to choose one style of wood décor and stick with it throughout the main living spaces. Mixing styles, like rustic and modern, can make a room look like it lacks cohesion. 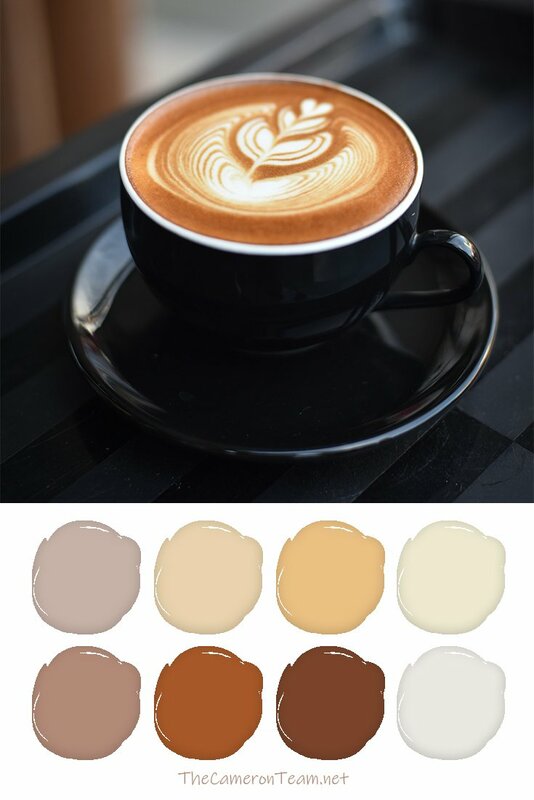 So, choose one and stay on track, and your home will be one step closer to looking professionally decorated. Do you have a favorite wood treatment design idea? Share it in the comments! See post #4 of the 2018 Home Trend to Watch Series: Fringe.